Within the spinal cord, either an enhancement and/or an inhibition of ascending nociceptive afferences come into effect. The spinal cord is also considered as the major site where a number of analgesic agents initiate their mode of action through direct binding at selective inhibitory receptor sites (Figure I-19). Melanocortins are a group of endogenous peptides that are derived from pro-opiomelanocortin. The melanocortins include adrenocortico-tropic hormone (ACTH), and the X- and 6-melanocyte stimulating hormone (MSH). Recent studies indicate that spinal melanocortin receptors (the MC4 subtype) are upregulated in animal models of neuropathic pain. Also, both (X-MSH and 6-MSH have been identified in areas of the spinal cord associated with nociception . The MC4 melanocortin receptor agonists MTII and d-Tyr-MTII increase the sensitivity of rats to painful stimuli following sciatic nerve constriction. In contrast, the pain responses are attenuated following pretreatment with the melanocortin receptor antagonist SHU9119 . Cholecystokinin (CCK) belongs to a gastrin family of peptides. In the central nervous system it is widely distributed and predominantly exists as CCK-8, which binds to CCKs or CCKz receptors. In the periphery, the receptors that normally bind CCK are CCKA or CCK1. Axotomy leads to an upregulation of CCK in rat dorsal root ganglion. Antagonism at the CCK receptor by YM022 has been shown to produce analgesia following constriction injury to rat sciatic nerve. Administration of another CCKz receptor antagonist, L-365,260 has been shown to reverse tactile allodynia and thermal hyperalgesia . Interestingly, CCK is co-expressed with the ^-opioid receptor in laminae l and II of dorsal horn and seems to block the antinociceptive effects of endogenous opioids in models of neuropathic pain. Accordingly, CCK receptor antagonists can thus serve as potentiators of opiate-induced analgesia. One specific antagonist of a CCK receptor, CI-988, has been found to enhance the effects of morphine . The calcitonin-gene-related peptide (CGRP) is a 37 amino-acid vasodilatory peptide, of which two isoforms, aCGRP and PCGRP, have been described. CGRP is released from peripheral nerve terminals in response to an inflammatory stimulus, such as local application of capscaicin, often leading to hyperalgesia. Some 80% of substance P trigeminal and other sensory ganglia contain CGRP. However, CGRP is also found alone in C-fiber nociceptors. Both CGRP and substance P are increased during inflammation, but decrease following dorsal root ganglion lesions. CGRP is also co-expressed with galanin. CGRP antagonists, such as CGRP8-37, when injected into the dorsal horn lead to analgesia. Another antagonist of the aCGRP receptor specifically, BIBN4096BS, reduces vasodilatation and thus has potential for treating migraine pain . Figure 1-20. Excitability in the dorsal horn neurons is determined by balance between excitatory input from periphery and inhibitory inputs (local and descending). Loss of sensory function after nerve injury results in spontaneous firing of dorsal horn neurons in spinal cord a selective GalR1 receptor agonist may constitute a valuable tool for the treatment of neuropathic and inflammatory pain. could be prevented with the NO-synthetase inhibitor . While nitric oxide in acute or neuropathic pain only plays a minor role, it decisively is involved in the process of inflammation with transition to chronic pain. Consequently, agents that regulate the release of nitric oxide in pain therapy in the future may be of importance. Cannabinoids derive their name from delta-9-tetrahydrocannabinol (THC), the psychoactive principle in Cannabis sativa (marijuana). Anandamide (arachi-donylethanolamine) is the putative endogenous agonist for CB1 and to a lesser extent the CB2 cannabinoid receptors. It also acts as an agonist at the VR1 vanilloid receptor . CB receptors are found predominantly in the central nervous system. They are also found on 10-13% of CGRP- and substance P-containing neurons and on interneurons in the dorsal root ganglia [44, 45]. CB2 receptors are localized primarily on peripheral nerve terminals and on cells of the immune system . Agonists at CB receptors are analgesics and may have therapeutic value in managing allodynia and chronic hyperalgesia such as cancer pain. 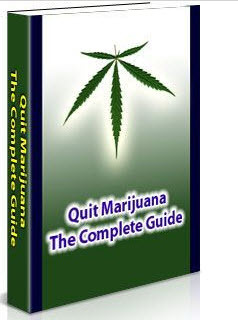 Antagonists such as SR 141716A block the antinociceptive effects of cannabinoids. However, CB agonists that cross the blood-brain barrier may have the same psychoactive properties as THC. 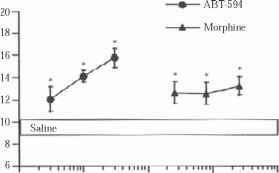 For example, the CB1/CB2 agonist WIN 55,212-2 is self-administered by mice . Interestingly, CB2 agonists, such as HU-308 and AM 121 also possess antinociceptive properties, and AM 121 specifically appears to be devoid of central cannabinoid effects. Several animal models of inflammation and pain indicate that ATP facilitates the transmission of pain input and modulates pain signals via the activation of ionotropic purine/pyrimidine receptors referred to as P2X receptors. 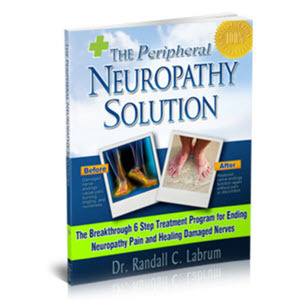 ATP is released extracel-lularly in the vicinity of nociceptors under a variety of conditions, including tissue injury, visceral distension and sympathetic activation . Heteromeric P2X2/3 and homomeric P2X3 and P2X2 receptors are selectively distributed within pain pathways. P2X3 receptors are almost exclusively expressed on small diameter sensory neurons that conduct nociceptive inputs from the periphery and have also been localized in the dorsal horn and lamina II of the spinal cord, as well as in the trigeminal ganglia. Other ionotropic P2 receptors, P2X2, P2X4 and P2X6 also appear to be involved in central nociceptive pathways[48, 49]. Metabotropic P2Y purinergic receptors may also be implicated in pain transmission. Unlike the ionotropic P2X receptors that seem to be involved in enhancing pain transmission, the P2Y receptor agonists UTP and UDP reduce spinal pain transmission in several rat models . 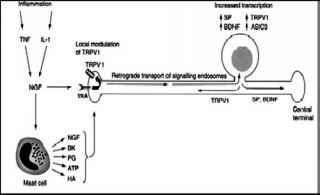 However, a pronociceptive effect of UTP also has been reported. These studies indicate that ionotropic receptor P2X3 antagonists or P2Y agonists may represent new approaches to explore in search of more effective pain treatment. The best-known vanilloid is capscaicin, the main pungent ingredient extracted from Capsicum frutescence chili peppers. Capscaicin activates VR1 vanilloid receptors that are present on afferent nerve fibers involved in pain transmission and neurogenic inflammation (Figure I-22). Although an endogenous ligand for the VR1 vanilloid (also known as TRPV1) receptor has not been identified, the endogenous cannabinoid anandamide activates VR1 receptors via a mechanism that is independent of cannabinoid receptor activation . However, evidence suggests that N-arachidonyl dopamine may be the best endogenous VR1 ligand. In addition, VR1 receptors are known to be activated by noxious heat, low pH and calcium depletion. Studies with gene knock out mice indicate that the VR1 receptor is essential for normal thermal nociception and for thermal hyperalgesia induced by inflammation. VR1 receptors are expressed on C- and A8-sensory fibers projecting to the dorsal horn of the spinal cord and on trigeminal afferents projecting to the hypothalamus, limbic system and neocortex. They are also expressed in non-neural tissues such as kidney, lung and spleen. The VR1 receptor is coupled to a non-specific membrane cation channel that is preferentially permeable to calcium and sodium ions. This channel is not affected by conventional channel blockers, but can be blocked by ruthenium red . Activation of VR1-positive fibers by capscaicin, resiniferatoxin (RTX) and their analogs evokes sensations ranging from heat to burning pain. Activation is followed by loss of further sensitivity to capscaicin, insensitivity to noxious heat and chemical stimuli and loss of the ability of the fibers to release neurochemicals, such as substance P and CGRP, and elicit inflammation. This agonist-induced desensitization has been exploited in the use of capscaicin and capscaicin analogs as topical analgesics. VR1 antagonists may also be useful in the treatment of inflammatory hyperalgesia and pain. Capsazepine is the prototype competitive VR1 antagonist. The recently identified antagonists, JYL 1421 and 5-iodo-RTX, are 25-60 times more potent than capsazepine. The role in pain management of compounds such as arvanil, with dual CB1NR 1 agonist properties is currently an area of great research interest . Recently the vanilloid receptor homologs VRL-1 (TRPV2) and VRL-2 (TRPV4) have been identified. Both are non-selective cation channels. VRL-1 channels are localized on A8 and C-fibers in laminae l and II of the dorsal horn. They appear to mediate high threshold heat responses. The affinity of VRL-2 is less defined, but may be involved in responses to pressure or stretching . It is suggested that the VR1-receptor sensitizes heat response by opening the channel where NGF also contributes to the heat pain responses. Figure 1-24. Formation of inflammatory-related cytokines affecting sodium-channel expression with hyperalgesia play a role in neuropathy, inflammation and chronic pain states, while NaN/SNS2 channels are involved in acute pain . Most local anesthetics block sodium channels by binding either to the voltage sensor site or to a receptor that blocks the sodium pore, both of which are localized to the IX subunit. However, it appears that sites on the 6 subunit may also constitute viable targets for therapeutic intervention in pain. The pore-forming potassium channels, TREK, TRAAK, TWIK and TASK, differ structurally from ion-gated potassium channels. They are widely distributed in the central nervous system and are targeted by arachidonic acid and other unsaturated fatty acids . 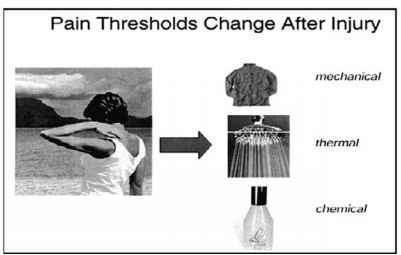 Volatile anesthetics (e.g., halothane, ether, chloroform) seem to stimulate these channels, especially TREK, leading to depression of neural activity. Local anesthetics that target sodium channels (e.g. lidocaine, bupivacaine, mepiva-caine) also activate the TASK channel. Activation of high-threshold voltage-dependent L-, P-, Q- and N-type calcium channels on spinal neurons is involved in the mechanisms underlying acute pain, hyperalgesia and allodynia induced by a variety of stimuli . Most research interest has focused on N-type calcium channels. Rats lacking the 63 subunits of this channel show reduced C-fiber "wind-up" of spinal cord activity in response to sensory nerve stimulation and a reduced response to neuropathic pain. N-Type calcium channels appear to be localized on presynaptic nociceptive terminals where they serve to enhance the release of substance P and glutamic acid . Blockade of N-type channels with w-conotoxin GVIA reduces spinal cord hyperexcitability due to both innocuous and noxious sensory nerve stimulation. However, the concentrations at which these compounds are effective also induce toxic effects, thereby limiting their clinical utility as analgesics. Like N-type calcium channels, P/Q-type channels also appear to be localized presynaptically on glutamanergic neurons. P/Q-type blockers inhibit pain induced by the stimulation of glutamanergic fibers, but not that induced by the ionotropic glutamate receptor agonist NMDA . L-type calcium channels appear to be localized post-synaptically where they serve to enhance substance P-evoked neurotransmission . 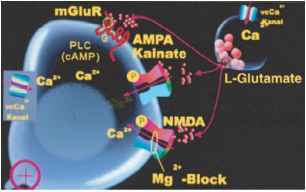 L-type calcium channel antagonists potentiate analgesia produced by K-opioid agonists and block the induction of opioid tolerance. The development of allodynia and hyperalgesia following nerve injury and inflammation is in part due to increased synaptic excitability manifested by long-term potentiation (LTP) in central pain pathways mediated by NMDA ionotropic glutamate receptors . Thus, LTP may underlie the plastic changes that occur in nociceptive pathways in neuropathy and other chronic pain states  and may be modulated by NMDA receptor antagonists. The NMDA receptor consists of NR1 subunit combined with one or more NR2 (NR2A, NR2B, NR2C or NR2D) subunits and has two amino acid recognition sites, one for glutamate, and the other for glycine, both of which must be occupied to allow channel opening. Antagonists of the NMDA receptor that have been identified selectively compete for either the glutamate or glycine site (Figure I-25). Subunit-selective (e.g. NR2B) antagonists have also been identified. Several high affinity NMDA antagonists and channel blockers, such as CPp, MK-801 and ketamine, may reduce hyperalgesia in animal models. However, the psychotomimetic effects, memory and motor impairment, induced by these compounds limit their utility. Selective glycine receptor and NR2B antagonists display analgesic properties that are devoid of deleterious side effects . Low affinity NMDA channel blockers, such as memantine, also attenuate neuropathic pain in animal and human models without psychotomimetic side effects . Other glutamate receptors have also been implicated in the transmission of pain inputs (Figure I-25). For example, kainate receptors located on sensory neurons may play a role in sensitizing pain states. The kainate receptor antagonist LY 293558 is antinociceptive in a capscaicin model of hyperalgesia. With every nociceptive stimulus neurokinins are being released in the posterior column of the spinal cord. Besides the tachykinins substance P, neurokinin A and B, excitatory amino acids like glutamate and glycine also are being released. The latter interact with specific receptor sites, which can be divided into ionotropic and metabotropic glutamate receptors. Following binding of the ligand at the ionotropic receptor, an ion channel is opened (Figure I-26) affecting the G-Protein, which causes secondary intracellular change with the propagation of action potentials. Because of this G-protein-related mediation of effects, and contrary to the metabotropic receptor, the ionotropic receptor is characterized by a fast response. 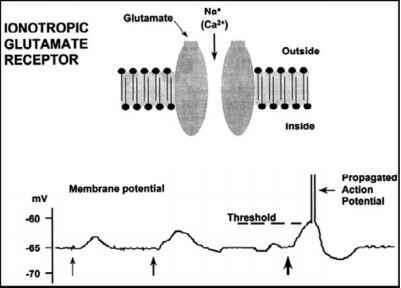 The metabotropic glutamate receptor is much slower by several orders of magnitudes, resulting not in propagation but in modulation of the receptor response. Both, the ionotropic as well as the metabotropic glutamate receptor can be subdivided into several subtypes. 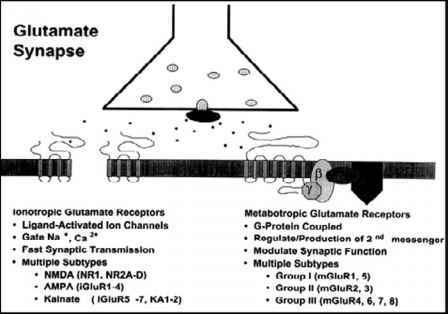 The ionotropic glutamate receptor exists as a NMDA-(N-methyl-D-aspartate) and of the non-NMDA-type. Depending on the nature of the transmitter involved in the transmission, the receptors can be differentiated into both the kainite- and the AMPA-receptor (a-amino-3-hydroxy-5-methyl-4-isoxazole-propionic acid) respectively (Figures I-27 and I-28). non-noxious stimuli result in an augmentation, which finally ends in a nociceptive reaction. 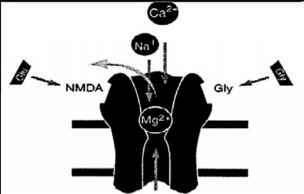 Because the NMDA-receptor is a voltage-type ion channel, any increase of inward transmission of calcium ions results in an increase of nociceptive transmission. And because the increase of Mg+-ions results in a receptor blockade, this "second-messenger" is of paramount importance in the process of pain transmission. This is because the inward Ca2+-current results in activation of enzyme changes within the cells of the posterior spinal column, and an activation of the genetic machinery of the nucleus, which is correlated with chronic pain conditions. The NMDA-receptor also has an additional PCP (phencyclidine)-modulating site, through which the receptor-dependent ion channel can be blocked. Such a mechanism is used clinically when ketamine interacts with the PCP-binding site, while magnesium and doziciplin (MK-801) inhibit transmission via a separate unit (Figure I-29). Following binding of the excitatory ligand glutamate at the voltage-gated, and fast acting ionotropic AMPA- and neurokinin-receptor, it initiates an increase of sensitivity of the slower metabotropic NMDA-receptor. 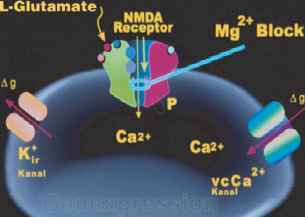 As a consequence there is an increase of current of Ca2+-ions through the NMDA-channel resulting in an increase of intracellular Ca2+-ions. Since this process is initiated by substance P through binding of neighboring neurokinin receptors, co-activation of glutamate-and tachykinin- (substance-P) receptors instigate neuroplastic changes within the neuronal matrix (Figures I-29 and I-30). Within the cell, the increase in calcium ions reinforces a postsynaptic c-AMP-response element-binding protein (CREB) synthesis of c-fos and c-jun, the target genes that increase the synthesis of amino acids in the formation of receptor sites. As a result, additional receptors are now available for binding, resulting in an increase of nociceptive transmission, which is reflected clinically in "augmentation" phenomenon with hyperalgesia (Figure I-31). Figure I-31. 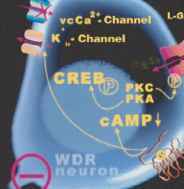 In chronic pain, protein kinase C (PKC) and protein kinase A (PKA) results in the activation of intracellular CREB (c-AMP-response element-binding protein), which expresses an increase in synthesis of excitatory receptor sites. A higher number of receptor sites results in higher transmission of action potentials responsible for the initiation of spontaneous, neuropathic pain, which can be blocked by opioids. OR-opioid receptor source of descending inhibitory input to the dorsal horn. In addition, the descending cholinergic pathway that modulates pain signals seems to contain Ach receptors. Stimulation of these receptors leads to analgesia in models of acute and chronic pain. Nicotine, the prototypic agonist of nicotinic receptors, displays antinociceptive properties at high doses, but this effect is of short duration. The nicotinic receptor agonist epibatidine is 100-200 times more potent than morphine at producing analgesia in preclinical pain models. However, epibatidine also produces ataxia, hypothermia and seizures, which preclude it from potential therapeutic use . Recently, a nicotinic receptor agonist, diazobicyclooctane (DBO-83) has been shown to have analgesic effects . ABT-594, an analog of epibatidine that binds to the Ach subunit of the nicotinic receptor (Figure I-32), also exhibits analgesic properties, but is devoid of the side effects characteristic of epibatidine . However, due to its side-effects in clinical trials new derivatives of the agent are under investigation. The NGF was the first neurotrophic factor to be discovered and purified. During the past 50 years, work on NGF established the concept that the survival of neurons in the developing nervous system is regulated by, and dependent on, neurotrophic factors . Until recently the pervasiveness of this concept has hindered the recognition of the role of NGF as a key pain mediator. However, these roles of NGF are not contradictory. The dependence of some populations of sensory and sympathetic neurons on NGF for survival is restricted to a brief window of development when they are establishing functional contacts with their targets. NGF is the founding member of the neurotrophin family of structurally related secreted proteins that includes brain-derived neurotrophic factor (BDNF), neurotrophin 3 (NT-3) and NT-4. Mature neurotrophins are homodimers that are derived by prote-olytic cleavage from precursor proteins encoded by separate genes. They bind to two types of receptor: a common receptor, p75NTR, which binds all neurotrophins with a similar affinity; and members of the trk family of receptor tyrosine kinases, trkA, trkB and trkC, which bind different neurotrophins. TrkA is the receptor tyrosine kinase for NGF. TrkA mediates the survival-promoting and neuron growth-promoting effects of NGF during development and its later pain-provoking actions (Figure I-33). The NGF also regulates the activity of several transcription factors, including c-FOS, c-JUN, ELK-1, forkhead-1, nuclear factor KB (NF-KB) and cAMP-dependent response-element-binding protein (CREB), which leads to alterations in gene expression . Figure I-32. Difference in receptor affinity of epibatidine, derived from skin secretions of the south american poison arrow frog (Epipedobates tricolor), and its derivative ABT-594, a highly selective AChRs-ligand, to neuronal, muscle and ganglionic binding sites. ABT-594 shows selectivity to neuronal subsites involved in the modulation of pain, being 20fold more potent than morphine in the thermal hot box model rapid post-translational changes in the transient receptor potential vanilloid receptor 1 (TRPV1) cation channel and by modulating the expression of genes that influence nociceptor function. NGF also sensitizes nociceptors indirectly by activating mast cells. 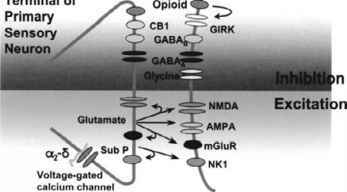 The inhibitory role of glycine and GABAb (7-aminobutyric acid type B)-receptor activation in spinal neuronal circuits has long been established. The same applies to the inhibitory effect of morphine-like molecules, which have an analgesic action. However, the recent discovery of the importance of microglia in pain sensation opens new avenues for investigating the effects of endogenous inhibitory mediators and pathways. The concept of anti-inflammation has been suggested to be an important determinant in the therapy of inflammatory pathology: malfunction or absence of one or more endogenous anti-inflammatory pathways and mediators could lead to persistent pain and inflammation, and prolonged disease. The central role of immune cells in pain associated with peripheral neuropathy has been established. Peripheral nerve injuries can lead to neuropathic pain states caused not only by a pathology in the damaged peripheral nerve and dorsal root ganglia (DRG), but also by a series of changes in the central processing of sensory information, which are best characterized at the spinal level. 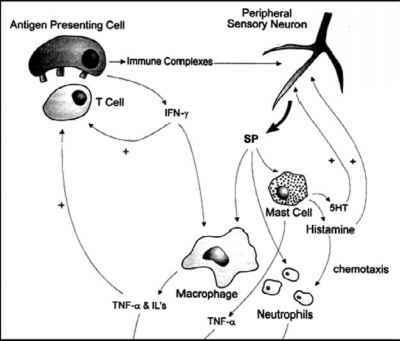 These changes are indirect, as the CNS itself is not damaged including changes in immune cell function. Two types of immune cell have been studied in this context - haematogenous leukocytes and resident microglia. Although there have been many studies of immune cell extravasations in the periphery, few have focused on the infiltration of immune cells into the spinal cord after peripheral nerve injury. For instance, extravasations of leukocytes (macrophages and/or T cells) occurs in the lumbar spinal cord 3-14 days after peripheral L5 nerve transaction. While the specific role of these infiltrating cells is not clear, they could even have neuroprotective or antihyperalgesic functions. Figure I-35. 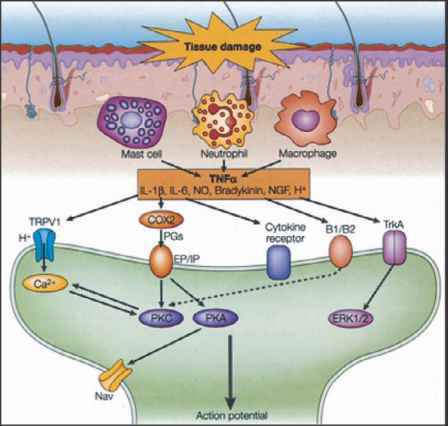 Activation of mast cells and macrophages by inflammation results in the release of various immune mediators such as tumor necrosis factor-« (TNF-a), interleukin-113 (IL-1B), interleukin-6 (IL-6) nitric oxide (NO), bradykinin, nerve growth factor (NGF) and protons, acting directly through receptor binding or indirectly through the release of other modulators such as prostanoids system, where MAP-kinase activates glial-formation, which in return results in the release of a number of neuroactive substances. It is not clear which factors activate microglia in the spinal cord in peripheral neuropathic pain states. On the basis of antisense and pharmacological evidence, Tsuda et al. showed that the activation of microglia in neuropathy requires P2X4 receptors, which are upregulated and specifically expressed by microglia in neuropathic pain models. Other evidence indicates that P2X7 receptors are expressed on microglia and that their activation by ATP can lead to the production and release of inflammatory cytokines. Indeed, mice that lack this receptor show an impaired ability to develop neuropathic pain. The released cytokines (TNFa and 1L-6) might themselves be involved in microglial activation. Despite some inconsistencies and uncertainties, microglial activation very likely is the important factor in the development of neuropathic pain. However, presently it is not clear how microglia produce pain and which mediators are involved. Activation of astrocytes in the relevant spinal cord segments seems to be crucial for the full emergence of neuropathic pain behaviour. In pathophysiological conditions, microglia can release various mediators, such as IL-lB, TNFa, PGE2 and nitric oxide. While some evidence indicates that intrathecal administration of IL-lB or TNFa can lead to symptoms of neuropathic pain in normal rats, the expression of both these cytokines is increased in models of neuropathic pain. Blockade of these cytokine increase reduces pain and hyperalgesia. Despite the lack of strong evidence about their source (i.e. neurons and/or microglia), these cytokines can modulate spinal pain processing in several ways. Activation of their receptors on spinal neurons can lead to rapid changes in neuronal excitability. 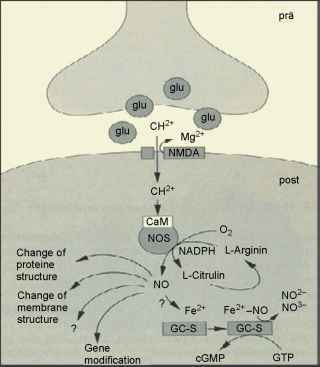 IL-IB or TNFa might also act indirectly through the release of nitric oxide and PGE2. However, spinal cord cytokines alone are probably not sufficient to explain neuropathic pain, which work in concert with other pro-nociceptive compounds (i.e. substance P and glutamate). Also, there is conflicting evidence about the roles of COX2 and PGE2 in the spinal cord after nerve injury. 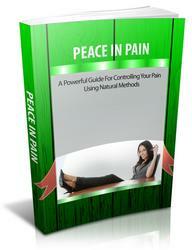 release pronociceptive compounds and/or directly influence pain pathways. Another mechanism might be neuronal apoptosis. IL-16 can trigger inflammatory apoptotic outcomes through nuclear factor-KB (NF-KB) transcriptional activation, which, in turn, increases the expression of caspase 3. Moreover, it has been shown that after SCI, apoptosis occurs in an important pain pathway, the spinothalamic tract. This is through a prompt decrease in BLC2-like protein 1 levels, which are also under the control of NF-KBI32. So, IL-16 could affect pain-signaling function through a pro-apoptotic effect on neurons of pain pathways. 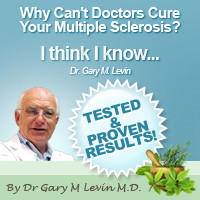 Multiple sclerosis (MS) is the most common chronic inflammatory disease of the CNS in humans. It is classically associated with demyelization and more recently with neuronal degeneration. Almost 50% of patients with MS experience significant pain at some point during the course of the disease and it is plausible that immune cell factors also contribute to MS-associated pain. More than 90% of patients with MS have high immunoglobulin G (lgG) concentrations in the brain or cerebrospinal fluid (CSF), which is indicative of the presence of an active inflammatory reaction. Also, histological studies of post-mortem material have shown that inflammatory infiltrates are present at the periphery of MS plaques, with features not dissimilar to those that are characteristic of active infection T and B lymphocytes, mast cells, macrophages, microglia and astrocytes, and all are recruited and/or activated. The role of these types of immune cells in the genesis of pain in MS remains largely unexplored, but the participation of microglia is an attractive possibility. It is not clear which mediators are released and how they affect the pain processing pathways in MS. The activated immune cells can release all the pro-inflammatory cytokines that are involved in neuropathic pain of peripheral origin. It is well documented that the concentrations of cytokines are elevated in clinical cases and in animal models of MS, but which of these cytokines are important in the pain caused by MS is not clear. 1. Both microglial and astroglial cells are activated by spinal cord or peripheral injury; they express receptors and locally release neuroactive substances, which result in chronic pain. 2. Activation of signaling molecules (MAP-kinases, and chemokine receptors) by spinal microglia or astroglia. 3. Astrocytes within the spinal cord enhance pain afferences of neuropathic origin. 4. Phenotype switch from microglia to astrocytes, resulting in a change of symptoms in neuropathic pain. 5. Astroglia as well as microglia release chemokines (TNFa, IL-2, IL-6, IL-16) being activated by Schwann cells, result in an increased response of voltage-gated ion-channels (Na+, Ca2+, K+, Cl-) with either an increase in excitability and/or pronounced hyperalgesia. Which factor increases the excitatory level of the spinal cord?